Home / Stock Picks / Stock Market Today / Is a Repeat of the 1987 Stock Market Crash Looming? Is a Repeat of the 1987 Stock Market Crash Looming? An analog chart model shows the stock market may be heading for a cliff, but will this actually happen? In October of 1987, stocks around the world collapsed, led by the S&P 500, which dropped more than 30% from peak to trough. Hedge fund manager Paul Tudor Jones saw it coming, and his fund returned a cool 62% in October 1987. What was Jones’ secret weapon? An analog chart model that correlated the markets of the 1920s to the markets of the 1980s. That model showed a 92% correlation between the movement of stocks in the 1920s, and the movement of stocks in the 1980s. It also perfectly projected the 1987 crash. Fast forward thirty years. I’ve discovered an analog chart model that correlates the markets of the 1980s to the markets of the 2010s. Specifically, it correlates the S&P 500 from 1978 to 1987 to the S&P 500 from 2010 to 2018. The correlation rate? 94%. In other words, this model shows that the stock market of the past eight years is trading similar to the stock market of the 1980s. The implication? A repeat of the 1987 crash is looming for the stock market. According to the analog model, the S&P 500 is due for a 30%-plus correction in early 2019. Will this happen? Or are these analog models just dumb luck? Let’s take a closer look. The analog model correlates S&P 500 adjusted daily closing prices from November 1978 to March 1987, with S&P 500 adjusted daily closing prices from May 2010 to October 2018. The correlation is astonishingly strong. Jones’ analog model supposedly had a correlation rate of 92%. This model has a correlation rate of 94%. If we project this analog model out, then a repeat of the 1987 crash is just around the corner. Specifically, the analog model calls for a 30%-plus drop in the stock market in March 2019. That is just five months away. Will this crash actually materialize? Although this analog to the 1980s stock market boldly predicts a huge crash in early 2019, I think that prediction is as flawed as it is bold. Recall that the motion of stocks is supposed to be Brownian. That means stocks subscribe to the random walk theory, and that they follow a random and unpredictable path. Essentially, stock charts are random squiggly lines. If you put two random squiggly lines together, shift them to your liking, and arbitrarily set beginning and end dates, eventually they will line up. But, them lining up doesn’t provide anything insightful. Much like the path stocks follow, having two squiggly lines correlate is just random. Let’s recall prior analogs. Sure, Jones reportedly had a successful analog model in the 1980s. But, considering that seems to be the only success story out there, it may as well be chalked up to luck. There was a chart floating around in early 2014 that had a 97.5% correlation between the stock market of 1928-29 and the stock market of 2013-14. That chart boldly predicted a massive stock market crash in 2014. Instead, from when the market was supposed to crash into the end of the year, stocks rose nearly 10%, and were in the middle of the longest bull market in history. More recently, there was a chart floating around that boasted a 94% correlation between the stock market of 1996-97 and the stock market of 2017-18. That chart predicted a massive stock market rally from the first February 2018 selloff into the next several months. Instead, eight months later, the S&P 500 is up just 1% from those levels. In other words, these analog charts work until they don’t, and they almost never work when you need them to work most. At the end of the day, fundamentals drive markets, not charts. And when it comes to the fundamentals, there is nothing similar between today and 1987. In 1987, you had an economy that was slowing from a rapid recovery, Treasury yields that were huge and falling, and an inflation rate that was running around 4%. Today, you have an economy that is just starting to boom, Treasury yields that are low and rising, and an inflation rate running around 2%. In other words, the economic conditions are starkly different. So, where will the stock market go over the next several months and quarters? I think it will head higher. Stock valuations aren’t extended and can support higher bond yields (the spread between the forward earnings yields and 10-Year Treasury yield is roughly 300 basis points, far above its long-term average). GDP growth is below trend, and every recession since 1970 has been preceded by above-trend GDP growth (GDP has followed a nice trend since World War II, and we are well below that trend currently due to a slow recovery from a big 2008 wipe-out). Debt levels remain reasonable and in line with long-term averages (net corporate debt to GDP is well off record highs, and simply in line with its long-term average). Overall, there aren’t any signs that a major stock market crash is around the corner. Meanwhile, economic and earnings growth remain robust, and valuations remain reasonable. As such, stocks should head higher. Analog models can be scary, and make bold predictions, which ostensibly seem reasonable. But, they almost never pan out. A repeat of the 1987 crash is not looming. Instead, stocks should bounce-back from this recent selloff and trade higher for the foreseeable future. 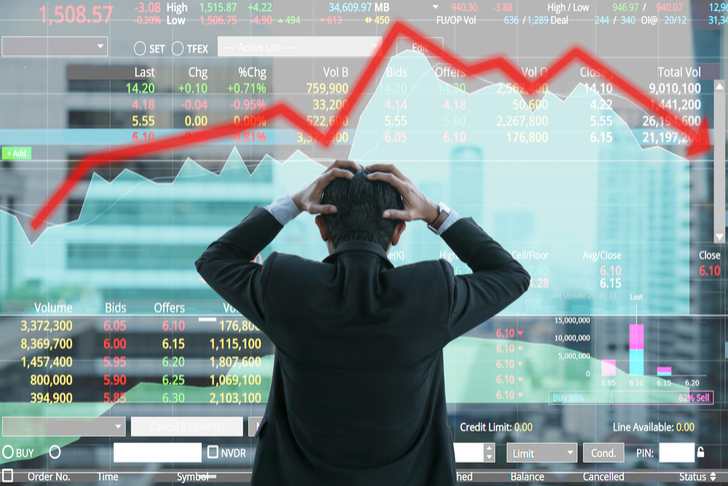 Article printed from InvestorPlace Media, https://investorplace.com/2018/10/is-a-repeat-of-the-1987-stock-market-crash-looming/.